Kansas officials are concerned that a formal NCAA infractions case may be developing into the basketball program after a recent reinstatement ruling, several sources told CBS Sports. Sources at Kansas, those close to the reinstatement process involving forward Silvio De Sousa and familiar with the NCAA process, said a door could be opening to one of the first formal infractions cases to stem from the wide-ranging FBI investigation into college basketball. Of chief concern to Kansas is the designation by the school of Adidas representative T.J. Gassnola as a "booster" of Kansas athletics in the De Sousa case. Earlier this month, the NCAA ruled De Sousa must sit out the remainder of this season and the 2019-20 campaign because his guardian received money from "a university booster and agent." That dual designation came as a surprise to Kansas officials who say they only agreed to designate Gassnola as a booster. Kansas athletic director Jeff Long described publicly on Feb. 1 how the school had to designate Gassnola "as a hypothetical" for the De Sousa reinstatement case to continue. Long said, that day, Kansas "disagreed" on how to define Gassnola's role but that the NCAA made it a condition of considering De Sousa's reinstatement. "The NCAA told us that they would not consider a reinstatement unless we included that information," Long said. "If we did not include the hypothetical, they would not consider reinstatement until after the enforcement investigation was complete." The school is in the process of appealing the ruling. The NCAA defines a booster as a "representative of a [university's] athletics interests." An agent is a person who "seeks to obtain any type of financial gain" from a player's enrollment or from a player's "potential earnings as a professional athlete." That dual designation is a bit of a worst-case scenario for Kansas. While the designation was to be used only in the reinstatement case, school sources are concerned it could be used as the foundation for an infractions case. Asked whether Kansas was being setup for a formal investigation, a source close to the case explained, "It certainly appears that way." Yahoo Sports reported in November that the FBI had given the NCAA permission to "begin its own investigation process" into certain schools. NCAA president Mark Emmert said in December investigations into schools named by the FBI "have already been launched," but he failed to identify individual programs. Earlier this month, Yahoo Sports reported that Arizona was under NCAA investigation. If a formal NCAA infractions case has been launched, Kansas would be the biggest name to date associated with the FBI probe. 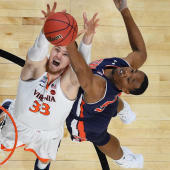 Since the FBI announced its investigation in September 2017, college basketball has braced for what could be significant NCAA penalties against the sport's blue bloods. The NCAA doesn't comment on potential or ongoing infractions cases. "Most of my cases that I deal with also have a student-athlete reinstatement component," said Michael Buckner, a South Florida sports attorney who specializes in NCAA cases. "My advice to my clients is … that [a reinstatement case] may impact the circumstances of enforcement later on." It's not clear why the NCAA couldn't designate Gassnola as it saw fit. Two sources familiar with the NCAA process said it was highly unusual that, in a reinstatement case, the association would propose a "hypothetical" to a school as a condition of processing a case. "I wasn't in the room but … never admit something that later [can be used against you]," said Buckner, who is not involved in the Kansas case. "I've been through a few cases where the university client is under pressure … to get this kid or group of kids eligible. [The thinking might be], do whatever you need to do to make the best argument in order to make that happen." There is also skepticism whether NCAA reinstatement officials working with Kansas could -- on their own -- come up with the Gassnola designation plan. Also concerning to some at Kansas, the school was instructed not to share information with coach Bill Self. Texts revealed in federal court show a relationship between Self and Gassnola. Gassnola has been described in federal documents as a fixer and bag man who allegedly bribed elite players to commit to Adidas-affiliated schools. Kansas is an Adidas school. Last year, he pleaded guilty of conspiracy to commit wire fraud in the FBI's wide-ranging investigation of college basketball corruption. Gassnola testified that he paid De Sousa's guardian $2,500 to pay for online classes. That impacted De Sousa's eligibility and could impact Kansas history. De Sousa played in 20 games last season, including all five in the NCAA Tournament. It has been speculated that Kansas could be forced to vacate any wins during that time, including its 2018 Final Four appearance. Gassnola has testified that Kansas coaches had no knowledge of his payments to the families of two KU players. One ongoing option for Kansas: It may file a "reconsideration request" in the De Sousa case. A school may request reconsideration in such cases "based on new information that was not reasonably available at the time of the decision," according to the NCAA. Last year, one person intimately familiar with the NCAA enforcement process told CBS Sports the enforcement division would have little credibility remaining "if they are unable to process cases" stemming from revelations in the FBI cases. While the FBI cases are criminal in nature, they helped pull back the curtain on the long-held beliefs about the seedy underside of college basketball culture. Yahoo Sports subsequently reported the FBI had given the NCAA evidence from the trials of some former assistants to use in the association's investigations.